Tall, sleek and deep chested, the elegant Greyhound is renouned for its speed and well known as a hunting and racing dog. 'Dish Lickers' is the well known Australian term for Greyhound races. Greyhounds are sweet, sensitive and reserved. Although they do shed some, they are one breed that does not typically trigger allergies. They can be timid, but if well socialized are affectionate and loyal companions. Greyhounds do not bark excessively and even adopted racing and show dogs can do quite well as pets. Greyhounds rarely have hereditary health problems, though osteosarcoma and esophageal disorders are sometimes found in these dogs. However they can develop bloat, which can be life threatening for them, and they are very sensitive to some drug treatments as well as pesticides These should be considered when selecting a Greyhound for a pet. Amazing movements of the greyhound in slow motion. Breed Type The Greyhound is a breed of sighthound. Known for its amazing speed, it is currently bred for hunting, racing and companionship. This breed is sensitive to cold weather. Background This breed has a very long history, it is the only dog breed mentioned in the Bible. The greyhound came to England in the fifth century. Although much is uncertain about the breed's origin, it is thought to have come from Egypt. 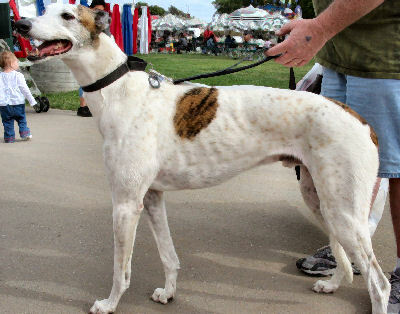 Early Greyhounds were used for hunting and in medieval times, royalty had Greyhounds bred to produce various colors. Description Greyhounds are tall and sleek, with deep chests and curved spines. The head has a unique shape, with a wide skull, a nearly imperceptible stop, and tapered muzzle. The ears are small and folded, and the eyes small and dark. Their coats come in a wide variety of colors, both solid and combination, thirty of which are recognized by kennel clubs. Males are 28-30 inches tall and weigh 65-70 pounds, and females 27-28 inches tall and 60-65 pounds. Care and Feeding Greyhounds do best on a diet of chicken, lamb and barley. They should eat a few small meals each day to help prevent bloat. They need regular brushing. Dry shampoo is sufficient for cleaning, and should only be used when necessary. Greyhounds shed moderately, necessitating regular vacuuming, but this breed does not typically trigger allergies. Housing Your Dog Greyhounds can live indoors or out in moderate climates. They can be outside in cold climates, but they will need a sweater or coat to keep them warm. This breed can thrive in a small space and needs a soft bed to sleep on to prevent the development of sores. Social Behaviors Greyhounds can be timid, so it is important that they are well socialized when they are young. They are friendly with other dogs, but are not suitable for small children. Most can be trained to refrain from chasing small pets. Handling and Training This breed is rather independent, and that sometimes presents difficulties in training. Firm, gentle and consistent training with positive reinforcement can be successful. Housebreaking may go slowly for Greyhounds. Activities Greyhounds need plenty of exercise, including a daily walk and plenty of time to run off leash. A fenced-in yard is recommended. Breeding/Reproduction Health problems of the Greyhound that may be linked to genetics include esophageal disorders and cancer. Bloodlines of potential mates should be checked for these things. Common Health Problems A primary health concern for Greyhound owners is bloat. This can be prevented with proper feeding practices. If bloat does occur, prompt medical attention is necessary to save the dog's life. Greyhounds are also sensitive to drugs, including pesticides. Availability Greyhound puppies are somewhat rare, but adult ex-racing dogs can often be found through rescue organizations. Cost of puppies is typically $1,000-$2,000.